Today’s cellular-based transmitters open a world of opportunity for live video. Delivering a major live event like the Olympics, a national political convention or the World Cup to your audience using mobile cellular transmitters and an IP-based network can be scary for even the most seasoned broadcaster. To help alleviate those fears, here is a list of best practices. The first thought should be location. Think strategically when you’re broadcasting live over IP from a crowded venue. Scope out the interior location before the scheduled broadcast to see what the cellular signal availability is like inside the building. For example, if you’re in the basement floor of a large stadium or convention center, what type of cell service is available? You’ve got to know this before showing up. How reliable is the connection, and how long will you be using it? A stand-up anchor stationed in one place is a much different scenario than a reporter walking around the venue, interviewing attendees. For a stationary shot, determine the best spots for the anchor positions before shooting. It’s essential to determine where your anchor is going to stand and then be sure it works. For coverage from inside the venue, it is critical to identify any dead spots in advance. For large venues, keep in mind that the environments inside and outside of the building will be different. Building interiors have support equipment, security even spectrum allocation restrictions. 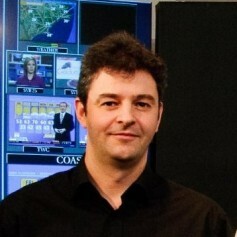 It is likely someone connected to the venue is responsible to manage the spectrum. Part of their job is to be sure that all the RF created by the wireless mics, cameras and cell phones do not exceed environmental regulations. Always remember you’re competing with others for a limited resource. Even with Wi-Fi in the building, that doesn’t mean you can rely on that connection 100 percent of the time. With everyone else sharing that same cellular bandwidth for social media feeds, website postings, and the traditional media –most of them sending video - there’s real pressure on the available bandwidth. Given the unpredictable nature of cellular, it’s not always best for a broadcaster to put all their eggs in that basket for high-profile events. A wired Ethernet connection is significantly less prone to interference. Ethernet cables can be plugged directly into mobile cellular transmitters, resulting in a 100 percent reliable link. Overall, consider the amount of video you’re going to move, style of reporting and tolerance for problems. Those solely streaming to a website may have a higher tolerance for interference and not need the reliability of an Ethernet connection. A broadcast network may want the added security an Ethernet connection provides. 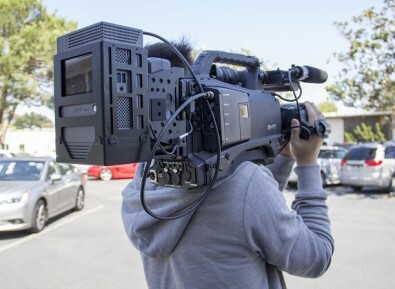 When operating within a crowded venue, especially if the video is mainly originating from a fixed location, it may be wise for a broadcaster to use a wired connection. If there aren’t large crowds and you need mobility, Wi-Fi should work well. This TVU One transmitter from TVU Networks is shown here mounded behind the camera battery. This solution provides a mobile yet reliable link back to studio or truck. For the majority of day-to-day reporting, a regular cell connection will suffice. But, if you know you’re going to be contending with crowds, many of which are uploading, streaming and recording with their cell phones, just understand this competition for spectrum means you should not rely on regular cellular service alone. Before producing a show, consider how critical the live video content is and the extent of competition for bandwidth you’ll face during the event. Maybe a record now, play later scenario will work for you. And remember, there are any number of file-based workflows embedded in today’s top mobile cellular transmitters. There are several ways you can send video to the same place. The unit can act as a hotspot and FTP an edited video back to the station. Or, the video can be stored on a thumb drive and downloaded to the unit for transfer to the home station. Because it uses all the cellular connections, not just one as an FTP download does, that transfer is exponentially faster. Think of your mobile transmission unit as the video version of the Swiss Army Knife. The live transmission challenge depends not just on the potential for interference from within a facility, but also with events occurring outside. Anytime you are on location and competing with tens of thousands of people contending for bandwidth, your transmission technology needs to be as flexible, lightweight and robust as possible. If you’re standing in the middle of 10,000 people with cell phones, as a broadcaster you want complete reassurance that your video will reach its destination immediately with the best possible quality. But, sometimes major events can occur over which you have no control, but can greatly affect your broadcast. One of those is a full cell service shut down by officials. In the event of civil disobedience, it’s something that can happen. If there’s no cell network, then what? That’s where custom solutions like private microwave MESH networks come in. MESH is an integrated MIMO (Multiple-In, Multiple-Out) antenna technology that allows you to have your own network with dedicated WiFi/Microwave Mesh bandwidth. It combines IP-based 3G/4G/LTE cellular broadcast with specially designed MIMO IP radio transmission technology to aggregate multiple cellular uplink and microwave MESH connections simultaneously. With mobile units taking advantage of cellular and microwave connections, any story from a quiet conversation to a zombie apocalypse, will get to the station. While mentioned earlier, it bears repeating: always look for every advantage when you’re dealing with a finite resource.